You’d think an historic pilgrimage route wouldn’t need a recently-updated guidebook. And, for much of the Camino Aragones, that assumption is reasonably correct. However, on what became my last day on that route, I learned that older guidebooks only work with a healthy dose of flexibility. After getting lost leaving Tiebas, I planned to recycle my guidebook as soon as possible. Unfortunately, I’d used the book to make plans for the day before setting off that morning. 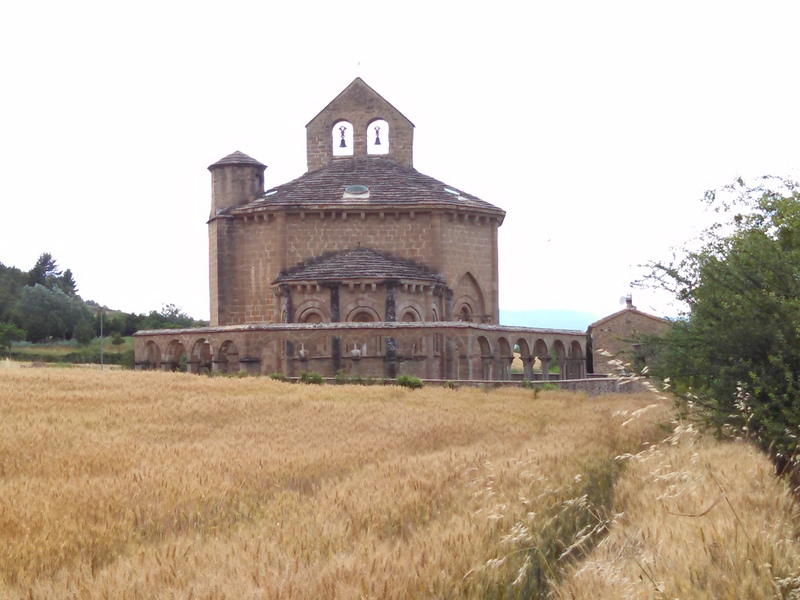 I intended to spend the night in the albergue it mentioned near La iglesia de Santa Maria de Eunate, an incredibly beautiful Romanesque church standing alone in a field. Even to my agnostic sensibilities, the church felt undeniably special and sacred; I found myself deeply absorbed in the act of sitting – and then singing – inside it. But, there was no longer an albergue nearby, so it was onward to Obanos. When I arrived in Obanos, the town was fully involved in a celebration. A band was playing in the bandstand, people (some of whom were dressed to the nines) danced in the streets, and food stands were set up around the central plaza, near carved wooden statues. While I enjoyed wandering around and enjoying these eye-level statues, larger-than-life replicas of religious figures were unloaded in the town. After I’d explored for a while, I headed to the albergue to drop off my bag and eat some dinner. Big surprise: It was closed. By this point, after little shuteye the night before and some 37 kilometers of walking and getting lost, I was very ready to lie down. Instead, I got what Quiver once called “morale on a plate” (some patatas fritas), shouldered my pack, and headed onward once more. While I’d intended on sleeping on the quiet Camino Aragones rather than the Camino Frances, the bustling route most people simply know as the “Camino,” I now had no choice: The next town was Puente la Reina, an important destination on pilgrimages of ages past and today, a town where several routes converge into one Camino bound for Santiago. And, that’s why at 7:20, 13 hours after I’d set off from Izco that morning and a solid five hours after most pilgrims had finished their day’s walk, I shuffled into Puente la Reina, a little road weary, a little footsore, and a little wide eyed as I took in the town, which was overflowing with pilgrims. As walkers had for centuries before me, I had arrived.